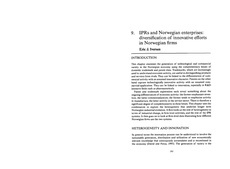 This chapter examines the generation of technological and commercial variety in the Norwegian economy using the complementary lenses of domestic trademark and patent data. Trademarks, which are increasingly used to understand economic activity, are useful in distinguishing products and services from rivals. They can be linked to the differentiation of commercial activity with an assumed innovative character. Patents on the other hand capture technologically innovative activity with an assumed commercial application. They can be linked to innovation, especially in R&D intensive fields such as pharmaceuticals. Patent and trademark registration each reveal something about the ongoing differentiation of economic activity: the former emphasizes invention, the latter commercialization; the former rends to emphasize activity in manufacture, the latter activity in the service sector. There is therefore a significant degree of complementarity in these lenses.This chapter uses the combination to explore the heterogeneity that underlies longer term Norwegian industrial evolution. It first looks at the role of heterogeneity in terms of industrial change, in firm-levelactivities, and the role of the IPR systems. It then goes on to look at firm-leveldata illustrating how different Norwegian firms use the two systems.